The theft of personal information from more than 100million South Korean credit cards and accounts, reportedly including those of President Park Geun-hye and UN chief Ban Ki-moon, has ignited a storm of anger and litigation against credit firms. Not a day passes without news of international and domestic surveillance activities of the so-called 'Five Eyes states' (the US, UK, New Zealand, Canada and Australia). Due to this threat, the demand for encryption technology has increased tremendously in recent months and German cryptology suppliers are uniquely positioned to profit from this development. As part of Brady's continuing effort to streamline our businesses, work more efficiently and get closer to our customers, PDC in Europe are combining with BIG France, BIG UK and CIPI Europe to form one company. The Advanced Keys TDB004 Counter Top Transponder Key Tester offers a simple check to ensure a key or remote control has a working transponder fitted and also a fast and easy way to check if the transponder is responding. Once upon a time there was a wonderful firm of Swiss watch-makers. So skilled were they that their watches became a symbol for quality. Rolex! Who has not heard of them? Who has not desired one? So, it came to pass that in a land in the East men who had not acquired those skills found a way to make watches that looked like the wonderful Rolex. The mechanisms were rougher and cheaper, the tick was louder, the hands moved erratically, the "gold" plate wore off but still the trademark Rolex would be on a wrist. "See my Rolex" you could say, and "by the way can you tell me the right time?" A rusty "Bolex", not a trusty Rolex. Viscount Systems has introduced Liberty, a scalable IP Access Control system that does not require control panels. Each Liberty kit includes a Nano Cube web server, a 2 door IP Encryption Bridge, and 2 RFID readers. 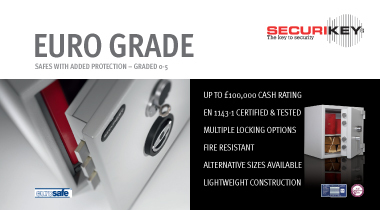 The system can be expanded at a low cost by simply adding additional IP encryption bridges and readers. Optional accessories include input/output IP bridges for monitoring auxiliary doors, and IP bridges for controlling elevators. KAR Auction Services, Inc., a provider of used vehicle auction services, announce the acquisition of Miami, Fla.-based High Tech Locksmiths (HTL), which specializes in products for the automotive industry. HTL is the largest provider of transponder, remote, high-security and car smart keys in North America. KAR Auction Services, Inc. CEO Jim Hallett made the announcement. "I am pleased to welcome Jay Wiener and his entire team to the KAR family," said Hallett. "High Tech Locksmiths utilizes technologically advanced equipment and processes that will benefit customers across the KAR business units. This acquisition allows us to provide a more consistent level of service to even more locations nationwide." 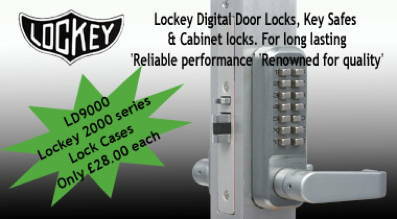 Locksmiths Exhibition - 5 Weeks to go! The special room rates at the Orchard Hotel are only being held until 31st January - that's this Friday. If you haven't ooked yet, call the hotel and mention the exhibition - I did also get an e-mail from them advising they had a sale on from the 30th so it may be worth a punt. All the regulars are going to exhibit, and over the next few weeks we will try and let you know what you can expect to see at the show. Global car theft decreasing... or is it? With a fall in traditional theft and a rise in electronic theft through organised criminal activity are we at the start of the next vehicle theft pandemic? There is no single profile to fit vehicle theft across the globe, and often not even across a single country or region. SBD's Global Car Theft Guide identifies common themes and elements to help our clients start to better understand the bigger picture. A man has been found guilty of shooting at two people who came to evict him from his home. Andrew Stephenson, 49, of Strathleven Road, Brixton, opened fire at a housing association worker and a bailiff on the day he was supposed to be evicted from his home, a court has found. A locksmith who opened the door for the bailiff was uninjured. Allegion has announced the appointment of Stefan Kobewka as Area Sales Manager for its CISA Hotel Locking Solutions brand, in a move which highlights the growing importance of the hospitality sector to the leading provider of safety and security products, formerly known as Ingersoll Rand Security Technologies. With more than 20 years of sales and business development experience, Stefan will be covering the south of England and Wales. Security check firm said to have defrauded U.S. The company that conducted a background investigation on the contractor Edward J. Snowden fraudulently signed off on hundreds of thousands of incomplete security checks in recent years, the U.S. Justice Department said last week, according to the New Yok Times. The government said the company, U.S. Investigations Services, defrauded the government of millions of dollars by submitting more than 650,000 investigations that had not been completed. The government uses those reports to help make hiring decisions and decide who gets access to national security secrets. The US Transportation Security Administration (TSA) has revealed some of the astonishing items confiscated at airports in 2013. Loaded guns, live ammunition, swords, throwing 'star' knives, dubious-looking containers of black powder, weapon replicas and even an 'inert' suicide bomber vest were all seized last year. A closed pub at a Derby retail park has been sold. Orchid Pub Group put The Master Locksmith, at the Meteor Retail Park, up for sale after it was deemed "not viable as a pub business." According to Orchid, it has now secured a deal for the property. Paul Kotrys, the firm's property director, said: "The Master Locksmith was not viable as a pub business hence Orchid's decision to sell it. The new owners took over on January 17." Orchid said that due to "contractual obligations" it was not able to disclose who the new owners were or their plans for the site. The pub was one of 290 bought by Orchid in 2006 from Burton-based Punch Taverns for £571 million. Cloud software maker VMware Inc is to buy privately held mobile security company AirWatch for $1.54 billion to tap into rising demand from companies needing to secure smartphones and tablets used by employees. This year's event will be the 5th annual Locksmiths Exhibition at the East Midlands Conference Centre, Nottingham and it's set to be the biggest and best ever. Over the 8th and 9th of March we're preparing to welcome 63 exhibitors and over 1,000 visitors. This is a truly national and international exhibition with visitors arriving from all over the UK, Ireland, and beyond. Two men who ran a company that tricked people into revealing personal details about their customers were prosecuted by the ICO on 20 November. The pair will now be sentenced, along with five colleagues who previously pleaded guilty to the same offence, at a separate hearing on 24 January 2014. 60 exhibitors have confirmed their attendance and a couple 'thinking' they may be a bit late as the last 3 starter stand go and that leaves one big stand available. Robbing ATMs is nothing new. There's the everlasting stick-em-up, the bogus card scheme, ATM phishing, and more. But, it appears new ways are being invented to pull off successful cash machine heists. It was recently revealed that thieves were able to access loads of ATM money by injecting machines with malware using USB drives, according to the BBC. These break-ins involved both low- and high-tech techniques. Apparently, the criminals manually cut holes in the machines to plug in USB sticks that then installed malware on the system. Once the machines were infected, the robbers would patch the holes on the dispensers. David and Niall set up Netwatch after a friend's bad experience - and turned it into a global success. Using the most advanced camera technology, the company can identify when intruders are attempting to break into a premises and, using leading-edge two-way communication software, they can speak directly to these intruders, shouting specific warnings such as "You in the red jacket, you are being watched by security cameras, please leave this premises immediately!" Approximately 90 per cent of the company's customers are from the commercial sector and include factories, offices and warehouses, garages, golf courses, GAA and rugby clubs and a growing number of church buildings. The former Willenhall Locks factory has been bought by 1st Access UK Ltd which is also based in the town and is investing £100,000 in the first expansion phase. The company, which was set up six years ago by Willenhall-born ex firefighter Jason Loydon and his partner Vikki Lindop, had a £2 million turnover last year and currently employs around 25 workers. British Olympic Association chief Lord Coe will consult with Prime Minister David Cameron, Special Branch and security chiefs on extra safety measures to protect Team GB during next month's Winter Olympics in Sochi. A home security company says it has provided more than 50 tape recordings to trading standards to put to rest claims it may have been misleading potential customers. UDS Solutions has been cold-calling homes in New Addington, near Croydon, Surrey, to sell its monitored alarm systems recently. But the council was alerted with some residents saying the company might have been wrongly claiming to be working with police and the council.